Happy Independence Day, America! Every year, families across the country celebrate the fourth of July by gathering together and having picnics, BBQs, lighting fireworks. This year, the days surrounding this holiday were very busy and hectic for me. 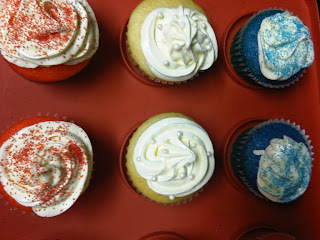 I wanted to create fun cupcakes (either along the BBQ theme, fireworks, or fancy American flags), but in the end I only had time to whip up some simple red, white, and blue cupcakes. I started with simple French vanilla (or some would say, white cake) and with 1/3 of that batter, I had the white cupcakes. The other thirds were dyed red and blue. 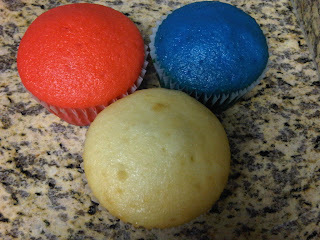 In the end, I easily created red, white, and blue French vanilla cupcakes. 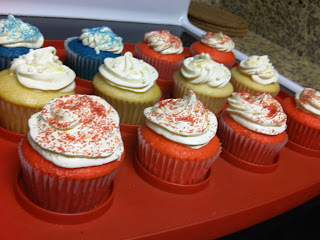 To top off the cupcakes, I just swirled simple white cream cheese frosting and added either red sugar sprinkles, blue sugar sprinkles, or white pearls to match the color of the cake. 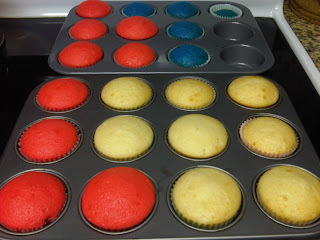 Last, I laid the cupcakes on my rectangular cupcake carrier so it looks like the American flag! 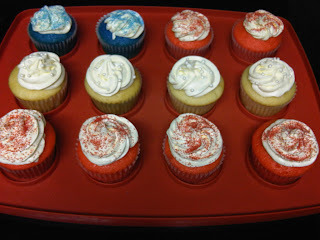 I didn't think of this idea until after the whole baking process or else I would have made mini cupcakes (easily to create the flag with 24 mini cupcakes than with only 12 regular size cupcakes). Simple. Patriotic. Happy Fourth of July! Cupcakes: French vanilla cakes tinted red, blue, or no tint with whipped cream cheese frosting topped with either red or blue fine sanding sugars or white sugar pearls.